Regardless of what you felt about Florida’s decision to hire Jim McElwain, it’s impossible to look at this Colorado State program and say that they aren’t better because he was there. It’s Mike Bobo’s turn now after a long stint at the University of Georgia. Bobo doesn’t necessarily need to copy McElwain, but he does need to adopt the same overall plan of leaving it, whenever that may be, better than he found it. 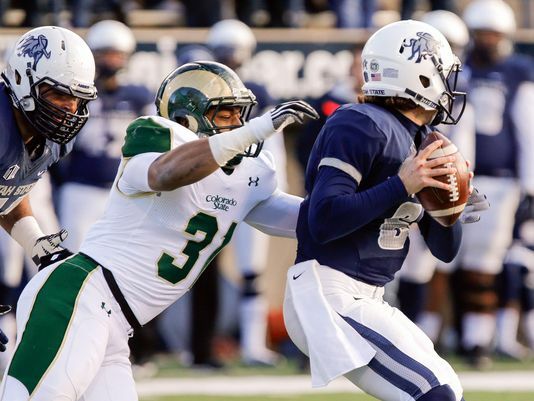 Colorado State may have a new coaching staff to break in, and they also have to find a new quarterback and primary running back, but they are set at receiver. 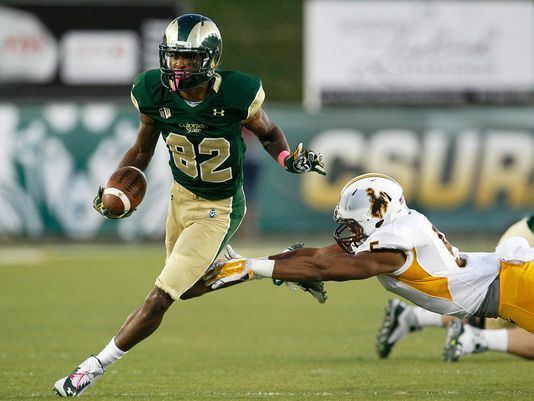 All-American and Biletnikoff finalist Rashard Higgins is back and ready to decimate the Mountain West again. Higgins caught 96 passes for 1,750 yards and 17 touchdowns last season. Higgins is also joined at receiver by Joe Hansley, who had over 500 receiving yards, and Xavier Williams, who went for over 400 yards, plus they have an all-conference tight end returning in Steven Walker. The Rams’ offensive line was solid last season, but their worst stat was an important one: sack rate. Garrett Grayson was sacked 27 times last year, and with a new QB coming in that needs to improve. Sam Carlson started at right tackle last year, but is moving over to the left side to replace first team all-MWC pick Ty Sambrailo. Fred Zerblis returns at right guard, and there are two starting centers returning. Jake Bennett was the initial starter last year, but started only three games because of injury before being replaced by Kevin O’Brien. The quarterback race began this spring with three legitimate contestants, but it seems like that’s been narrowed to two. 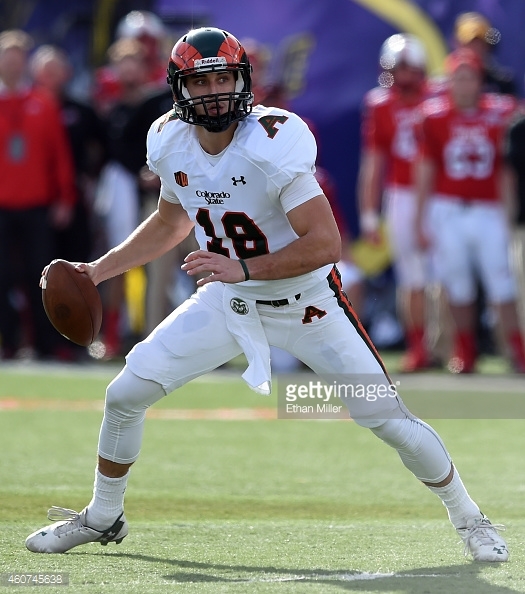 Nick Stevens was last year’s back-up and performed well in very limited reps (15 for 25 passing for 136 yards and a touchdown). Stevens is in the mix, along with redshirt freshman Coleman Key. Key and Stevens seem to have distanced themselves from junior Craig Leonard. Dee Hart left some big shoes to fill when he decided to declare early for the draft, but his two primary back-ups are both back. Treyous Jarrells and Jason Oden Jr. rushed for a combined 726 yards and 8 touchdowns last year, and it’s good news too that neither of them fumbled in any of their 133 combined carries. Those two should also be accompanied by Purdue transfer Dalyn Dawkins. Dawkins has impressed this spring, especially with what he has done running between the tackles. In the secondary, the top four tacklers from last season return, and only one notable player really departs in CB Bernard Blake. Blake led the team in pass break-ups last season. However, safety Trent Matthews and CB Tyree Simmons are both back. They had three picks apiece last season. Two other returning safeties, Kevin Pierre-Louis and Preston Hodges, are back and led the defensive backfield in tackles last season. This defensive line wasn’t a strength for the team last year, but with only one major player gone from last year’s team there should be room for guys to improve this year. LaRyan King is gone from the interior line, but the two guys who should be there this year, Terry Jackson and Justin Hansen, played in every game last year. SteveO Michel has also made the move from outside linebacker to defensive end as the defense transitions from a 3-4 to a 4-3. SteveO Michel’s move may add some much-needed playmaking to the line, but it will hurt the depth at linebacker, especially for a group that replaces two guys who accounted for 22.2% of the team’s tackles last season. Cory James was a solid player last year with 8.5 tackles for loss and 6.5 sacks, both of which led the team. The other two expected starters are Kevin Davis and Deonte Clyburn saw the field in most of the games last season, but they still haven’t done much for us to go on at this point. However, Mike Bobo was apparently impressed by them in the spring, because he said that he believes linebacker is still the strength of the defense. It’s not easy to replace a quarterback, a head coach and a 1,200-yard rusher in the same season, but this team is left with enough pieces that they ought to be able to do it reasonably effectively. The 10-win mark they posted last year may be out of reach, but 8-4 should be a both attainable and worthy record. The non-conference schedule isn’t the worst in the world, but the two biggest games, Minnesota and Colorado, are respectively a home and neutral site game.